Hi guys! March is the month where I celebrate my birthday and my blog's birthday. I seriously cannot believe that The Bargain Doll is actually 2 years old alreaday (eventhough I started blogging heavily early last year) and I've been very happy with the support you guys are giving me. (I'm really happy that I get to meet cool people online and in person) :D So, let me celebrate with you via giveaway courtesy of PINK FASHION. I've worn a number of Pink Fashion pieces on my blog a number of times and I must say that their collection are fun, girly and sweet. 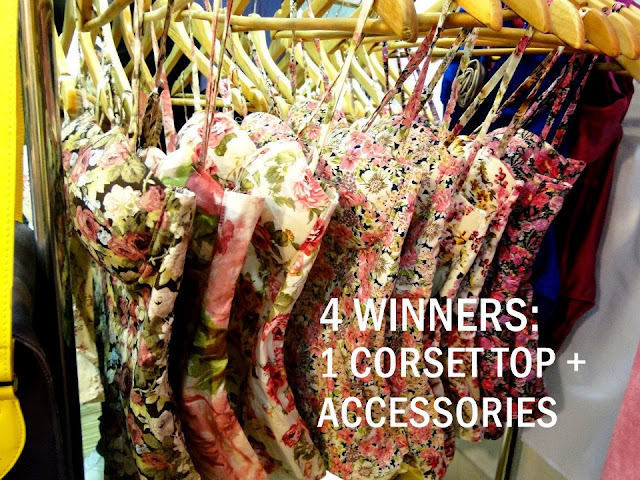 Owned by a good friend, Julie Anne Pink Fashion is collaborating with the Bargain Doll and is giving away CORSET TOPS and accessories for 4 READERS! i can't like the Pink Fashion fan page. It does not come out. I do agree. Pink fashion has no add button. no add button for Pink Fashion fb account. Same issue with Pink Fashion-what exactly do we add and where is it? Thank you. Thank you for the giveaway! <3 God bless! Your looking to good. Absolutely unique and fine piece of information. I've never spent that much time reading before but this is really awesome.